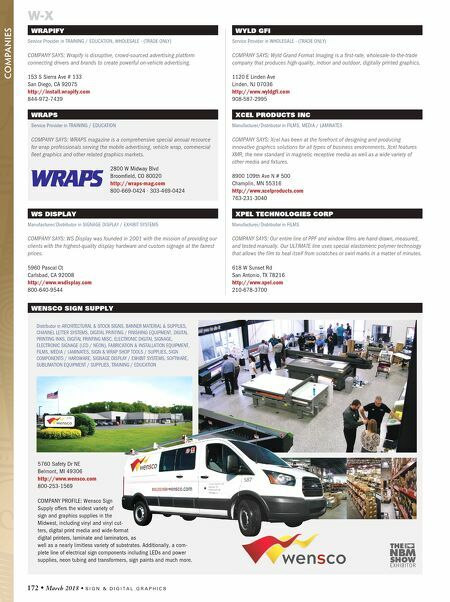 S I G N & D I G I T A L G R A P H I C S • March 2018 • 173 Z3 GRAPHICS Manufacturer/Distributor in AWNING SYSTEMS / SUPPLIES / EXTRUSIONS, SIGN COMPONENTS / HARDWARE COMPANY SAYS: Z3 Graphics offers a full range of sign graphic products including vinyl-applied flex faces, heat transfer flex faces, vinyl-applied polycarbonate faces, commercial and residential awning systems, computer cut text and logos, vinyl rolling stripping. 250 Feaster Dr Greenville, SC 2961 http://www.z3graphics.com 800-664-1093 ∙ 864-770-0789 ZUND AMERICA INC Manufacturer in CNC ROUTERS (XYZ), DIGITAL PRINTING / FINISHING EQUIPMENT, FABRICATION & INSTALLATION EQUIPMENT, SOFTWARE COMPANY SAYS: Zund is the world's leading manufacturer of digital cutting/ finishing systems. Built for 24/7 operation and powered by Zund Cut Center, Zund high-performance cutters offer extensive tool and automation choices, all designed for ultimate productivity. 5068 W Ashland Way Franklin, WI 53132 http://www.zund.com/en 414-433-0700 YELLOTOOLS INC Manufacturer in SIGN & WRAP SHOP TOOLS / SUPPLIES, SIGN COMPONENTS / HARDWARE COMPANY SAYS: YelloTools is the world's largest supplier of cutters, cutting rulers, cutting mats, foil bearing systems, cleaners, etc., for people who make signs, banners, print, label vehicles, produce neon signs, process self-adhesive films and more! Wilberhofener Str 3 D-51570 GERMANY http://www.yellotools.com 714-273-3223 YJ INC SIGN ENGINEERING Service Provider in ARCHITECTURAL & STOCK SIGNS, AWNING SYSTEMS / SUPPLIES / EXTRUSIONS, SIGN COMPONENTS / HARDWARE, SIGNAGE DISPLAY / EXHIBIT SYSTEMS, SOFTWARE COMPANY SAYS: YJ Inc. is a nationwide sign engineering firm with licensure in 48 contiguous states, plus Washington, D.C, Hawaii, and Canadian Provinces including British Columbia, Newfoundland and Labrador, Manitoba, Saskatchewan, Yukon with more pending. 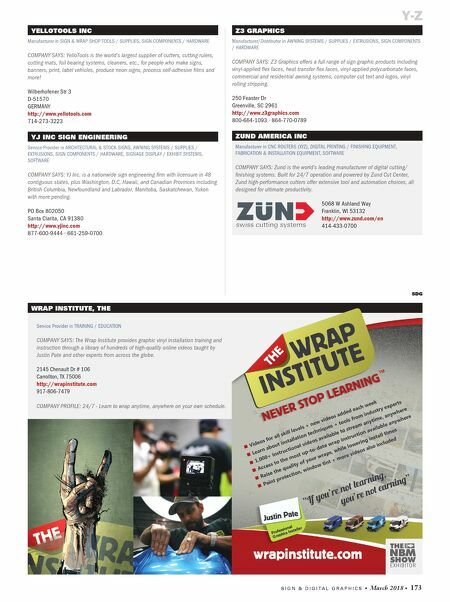 PO Box 802050 Santa Clarita, CA 91380 http://www.yjinc.com 877-600-9444 ∙ 661-259-0700 Y-Z SDG WRAP INSTITUTE, THE Service Provider in TRAINING / EDUCATION COMPANY SAYS: The Wrap Institute provides graphic vinyl installation training and instruction through a library of hundreds of high-quality online videos taught by Justin Pate and other experts from across the globe. 2145 Chenault Dr # 106 Carrollton, TX 75006 http://wrapinstitute.com 917-806-7479 COMPANY PROFILE: 24/7 - Learn to wrap anytime, anywhere on your own schedule.